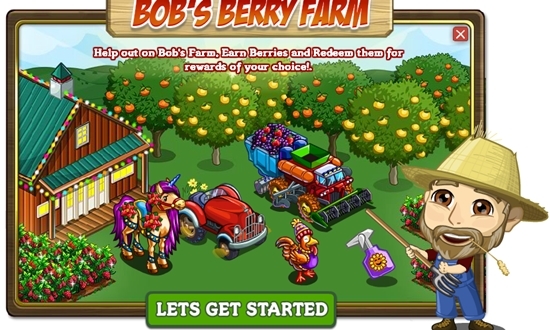 Join Farmer Bob in a special feature called FarmVille Bob’s Berry Farm. This new feature will make players to collect berries or Bob’s berry and used it to buy special items at the Market. There will be three difficulty setting for players to choose from. There will be easy, medium and hard difficulty setting. Here are some of the information about this feature including the crops we will need to harvest and the recipes etc. There will be 3 difficulty setting in playing the Bob’s Berry Farm feature. Which ever difficulty setting you choose, their goal is to collect berries. The medium and hard difficulty setting will be the one which will have the more chances of earning berries. You can used this berries to purchase special items at the Market. NOTE: It is not advise to use other variation of the crops eg. SUPER etc.. Plant ONLY what the quest is asking. In easy mode, you only need to harvest crops in order to get Bob’s Berry. The table below will show you which crops to harvest their Bob’s Berry equivalent. For ex. you need to harvest 40 Durum Wheat to get 1 Bob’s Berry or Raspberry x40 = 1 Bob’s Berry. Note: You may click the name of the crops to view it’s picture. On this setting we will need to craft recipes and harvest crops. The lists of crops is already listed above while the recipes is listed below. If you opt for this setting you can earn Bob’s berry in two ways, harvesting crops and crafting recipes. On this setting, we will need the help from our friends or neighbors with some parts or materials which means we need post the items that we need in order to get it. You’ll earn Bob’s Berry in three ways: harvesting crops, crafting recipes and posting items. How do I access Bob’s Berry Farm? I saw it once, maybe in the Market, but I was in the middle of doing something else, and I have not seen it again. A few of my friends have posted items from Bob’s Berry Farm, but I haven’t seen too many posts about it. i’ve grown the first crop [on my home farm] but didn’t get credit for it. we need more direction! WHERE do we grow and how do we use the items we craft? You can not use supercrpos. That can be the reason you do not get credit for your harveting. What do we do with the items that we craft for bob’s berry farm… I try to click use and nothing happens. I went to sell and they say they sell for $0 so what are they for other than taking up space in our storage?